萊特幣台灣礦池 Litecoin.tw: EBay CEO 對於 bitcoin 是認真的. look, john donahoe, ceo of ebay -- you wrote a column about this. i know, he thinks quite heavily that ebay may very soon start accepting bitcoins. this is what he had to say. i think there's no doubt digital currency is going to play an important role going forward, and at paypal, we're going to have to integrate digital currencies into our wallet. so cap it. how quickly do you think we'll see bitcoin in paypal? i don't know, i can't give a specific time. but i think you'll see bitcoin used in different use cases, whether it's a peer-to-peer use case, a cross-border transaction, someone's sending currency to someone else, and over time, you'll start to see it with some merchants accepting bitcoin. and i don't know how big it will get, how quickly, but the underlying theme is a digital coin something we should be aware of. do you own any bitcoin, personally? yes, i do. what do you think it should be worth? for me, i'm not buying it as an investment. i'm buying it to understand how it can be used. i think there are two sides of it, the investment side and the digital currency side. i'm more interested in the digital currency side. i don't know if it's a stockholm syndrome or what, but everybody that i talk to out here, and you sort of get into it, really does talk about bitcoin as the next big thing. and they believe it. and they mean it. it is not just some kind of fly-by-night thing they are playing with. they are serious and very big companies out here, very, very serious about it. 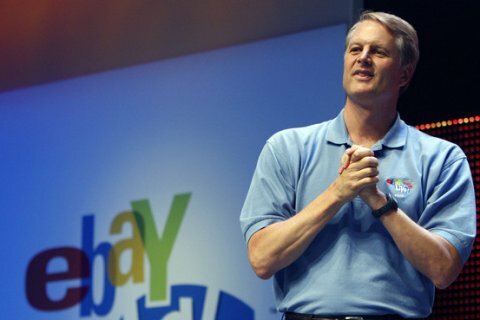 the other topic we talked to john donahoe about, we talked about his competitor, amazon, who's in that big fight with book publisher, hatchette. they're in a battle. you can't go mr. gladwell's book now on amazon because of that battle and i asked him what he thought of all of that. should we care about from a policy perspective, these kind of concentration issues? that's a great question. because what ebay represents is opportunity for small sellers. that's what ebay is made up of. we aren't a retailer. we don't compete with our sellers. we don't use scale against them. we give them the benefits of scale. ebay, from its very beginning, took entrepreneurs, took small businesses, and now also some large businesses, can give them an equal playing field to reach 140 million buyers around the world.